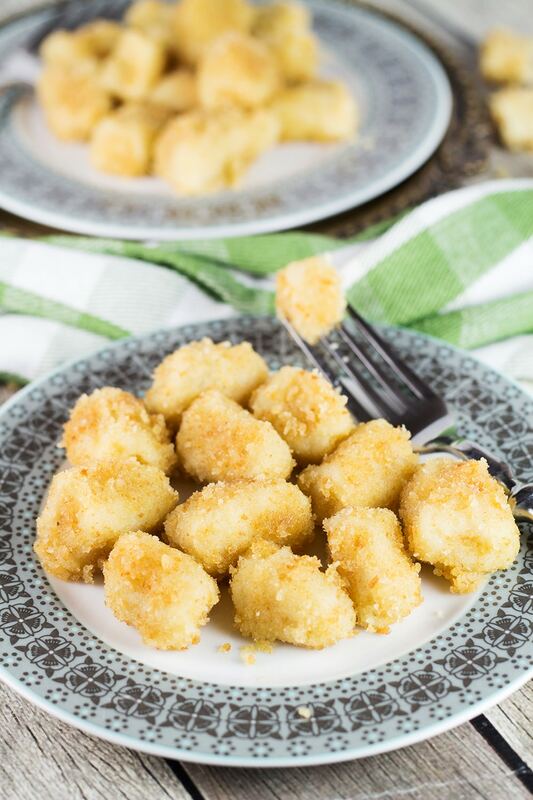 Perfect as a side dish, these Hungarian Potato Dumplings (Shlishkes) are made with mashed potato batter and rolled in buttered bread crumbs. 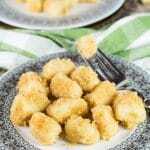 They are similar to Italian Gnocchi but have some fundamental differences. So good! A few days ago I posted a recipe for the delicious Hungarian Plum-Stuffed Dumplings. If you haven’t checked them out yet, do it. They are really awesome. Today we are once again going to Hungary because I am obliged to do so! Why? Well, the thing is, when Hungarians make those plum dumplings, the leftover mashed potato batter is always used to make small breaded rolls called Shlishkes. 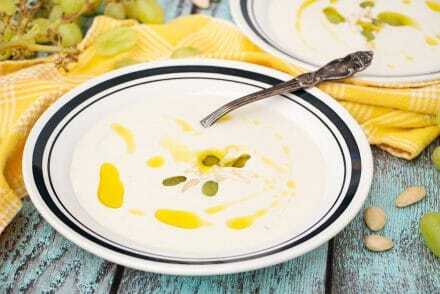 These two dishes are like siblings, you can’t make one of them while avoiding another! I couldn’t break these traditions, so we are making Shlishkes today! These are almost the same potato dumplings but without plums + they are not meant to be served as a dessert (you still can make a dessert out of them, just roll them in sugar). Shlishkes are more like a side for the main meal, usually containing meat. That’s exactly how I served these little guys – with a pepper steak. It was lovely. Oh, one more important thing that has to be mentioned. These potato dumplings are popular not only in Hungary but among Jews all around the world! 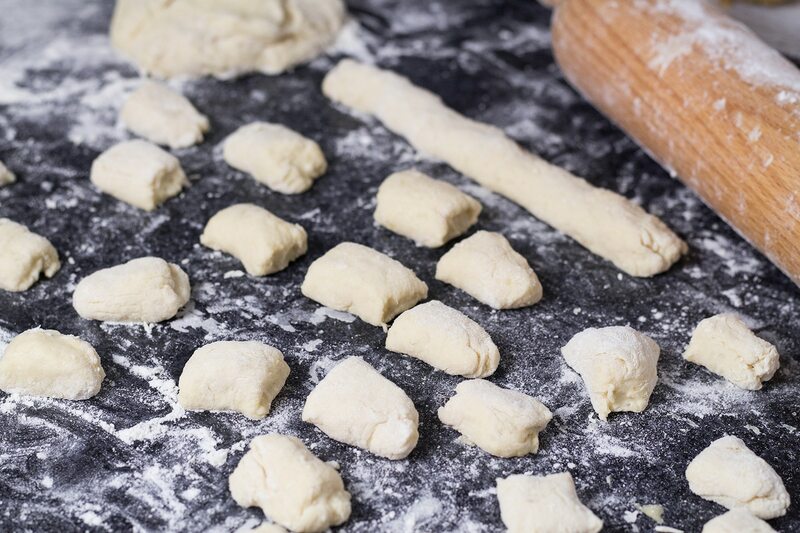 Now some of you may ask: what’s the difference between Shlishkes and Italian Gnocchi? Because these two look like the same dish. There actually are some differences, though. 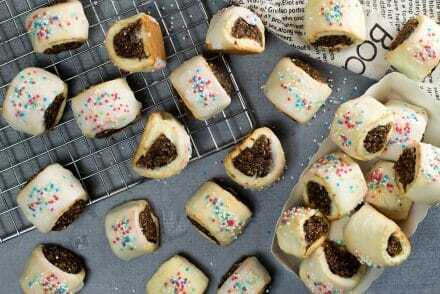 The Encyclopedia of Jewish Food names two of them: Shlishkes are firmer and they don’t have ridges. I can add the third one: Hungarian dumplings are first boiled then rolled in buttered bread crumbs, not sprinkled with cheese or drowned in sauces like their Italian cousins. I don’t know which version, Hungarian or Italian, originated first and I don’t think that it matters. Maybe neither of them were original founders because potato dumplings are made in many other European countries too. The most important thing is that these little guys are really delicious! Try them! These potato dumplings come from Hungary and they are really awesome. 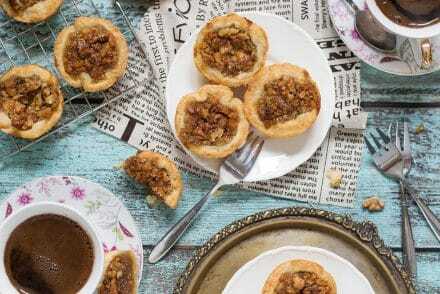 Made with mashed potatoes and rolled in buttered breadcrumbs, these little guys are guaranteed to become your favorites! Cook the potatoes in a lightly salted water, covered, until they are soft when pierced with a skewer. It should take about 30 minutes. Let cool, peel, and mash them in a bowl. Add the egg, egg yolk, and 1 tablespoon salt. Mix to combine. Add the flour in batches until you get a soft dough. The amount of flour needed depends on your potatoes. Transfer the dough to a well-floured surface and knead until smooth. It should be firm and not sticky. Break off walnut-sized pieces of the dough and roll each one of them between your palms to form a long strip 3/4 inch (2cm) in diameter. Cut into 1 1/2 inch (4cm) length pieces. In a large pot, boil the dumplings in batches, for 5-10 minutes. They are ready as soon as they rise to the surface. Remove with a slotted spoon. 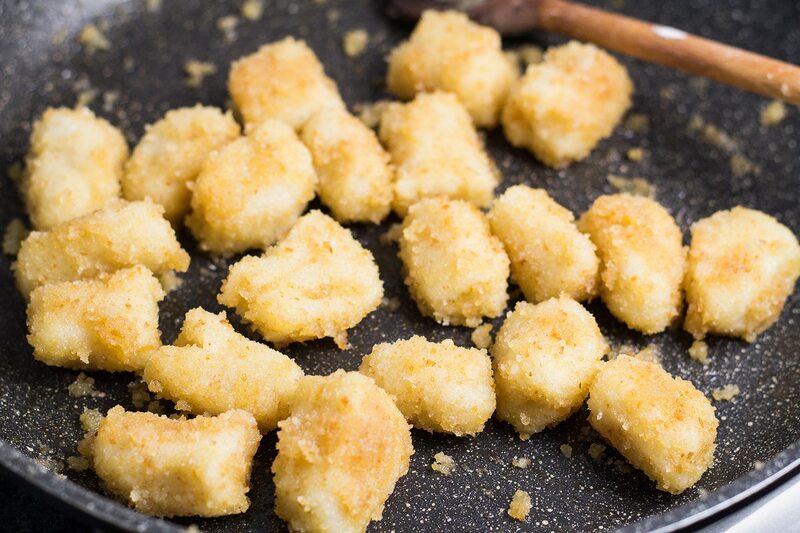 In a large skillet, melt the butter and stir in the breadcrumbs mixing well. Roll the potato dumplings in the mixture and serve. Enjoy! I love anything with potatoes and these sound delicious! I’ve never heard of Shlishkes before, so thanks for introducing them to me-they are definitely something I would love. I love gnocchi but I like how you can eat these as finger food without sauce. Thanks for stopping by and leaving a comment, Meg! Those potato dumplings look so good, they’re going to be a problem for my new years resolution though…. D’oh!!!! Wow! I bet these are amazing! My husband and youngest would love these. I love these potato dumplings! I want some now! These dumpling look so cute and I’ve never heard of the Hungarian Potato Dumplings (although had an Asian version of it). The ingredients and method look so simple, will try soon. Igor, first, I absolutely love that green towel. I am always looking for new ones. My favorite photo prop. These dumplings look so delicious. I love this kind of thing. Pinning so I remember to make this month 🙂 Just imagining what I could do with them! Michelle, yup, this green towel is really awesome 😉 I am happy you liked the dumplings! I feel you on the cold weather. It’s freezing outside here too and Shlishkes are perfect for warming up! Wow. These look like the best tator tot ever created. I LOVE potatoes (kind of obsessed, actually) and have never heard of these before but I am definitely making them now. 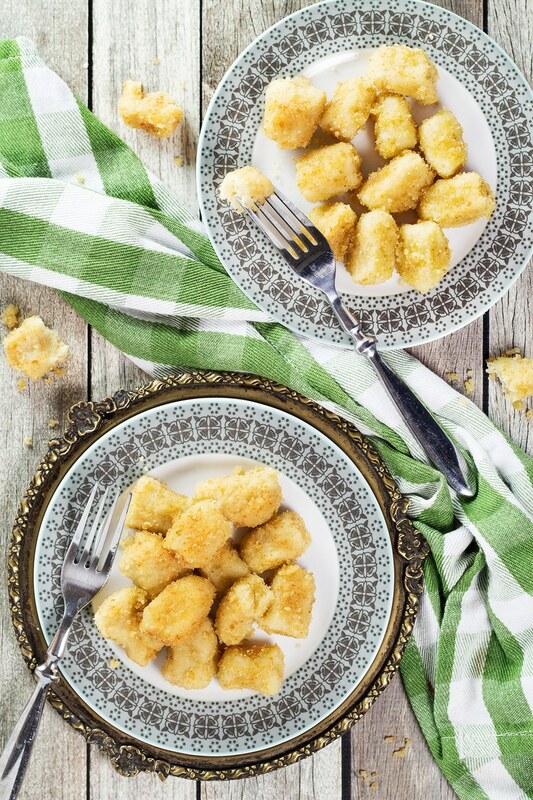 Oh man these look gnocchi to the next level….gotta try these!! A new potato dish to love!! just wanted to say how much i enjoy your food blog! i found it whilst looking for a good koshary recipe on pinterest, and ever since i have popped in occasionally, with great enjoyment. thank you. I am so happy to hear such words. Thanks a bunch! Just found your website! your concept is really lovely, I really enjoy browsing the content by country! As a born and raised Hungarian please let me add some extensions and comments to this recipe. This dish is do exist, however I have never heard this name or anything similar to this before, more likely to be called “Nudli”. Often made from leftover mashed potato as in Hungary mashed potato is usually left quite hard and not very creamy. You can try seasoning with cottage cheese-bacon-salt, steamed cabbage-bacon-pepper or poppy seed-butter-powder sugar is also a traditional combination. Shlishkes is a dish of potato-based small dumplings (called krumplinudli or nudli in Hungarian) popular in Hungarian cooking and often found in the Jewish cuisine of the Ashkenazi community. My mom used to make these. We would have ours with sugar sprinkled over them. They were so good….loved having these for supper. I can easily understand why 🙂 Sugar is a great idea by the way!